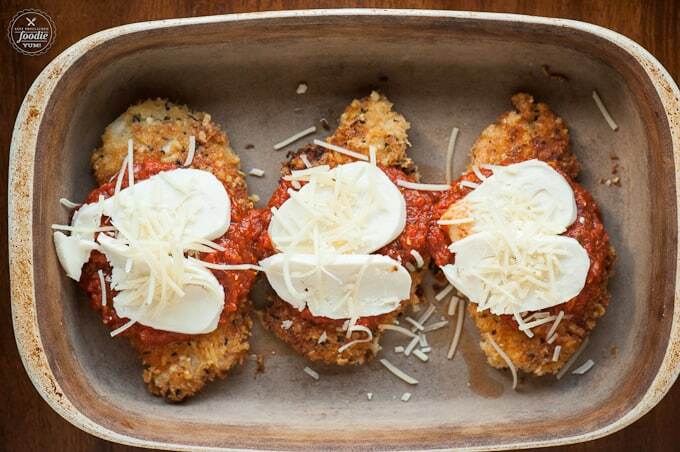 Perfect Chicken Parmesan is the best chicken parmesan recipe you’ll find. Full of flavor, takes minutes to cook, and is my favorite chicken dinner recipe! Perfect chicken parmesan is possibly my favorite dinner. If you’ve never made parmesan chicken, or its been far too long since the last time that you have, then this is the recipe you need to try! Any recipe that coats chicken in a wonderful crispy outside is a winner in my book, and the fact that this is such an easy chicken parmesan recipe will have you making this on a weekly basis. Chicken parmigiana, or chicken parmesan (also referred to in the United States as ‘chicken parm’), is a popular Italian-American dish. Parmigiana is a Southern Italian dish made with a shallow-fried sliced filling, with cheese and tomato sauce on top, then baked. Eggplant parmigiana is the earliest version. Some say this recipe is based on Eggplant Parmesan, where eggplant is replaced with chicken. What came first? The chicken or the eggplant? 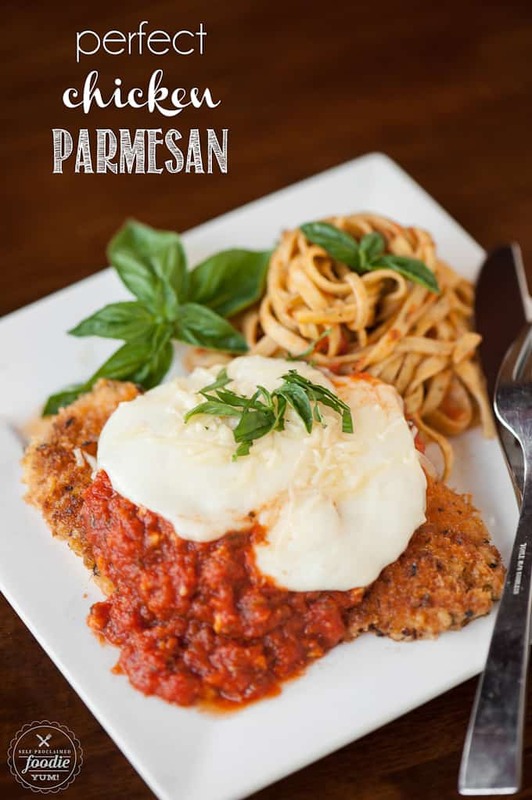 Parmesan chicken consists of a breaded chicken breast topped with tomato sauce and mozzarella, parmesan or provolone cheese. You want your chicken breasts when making parmesan chicken to be thin for several reasons. First, when you pound it with a mallet or roll it with a rolling pin, you break up the tissue and it makes it more tender. So much so that you can easily cut it with the side of your fork. I prefer to pound my meat over rolling it because its fun. Second, you want your meat to be of uniform thickness so that it cooks evenly. And third, the thinner the meat, the faster it cooks, and during school and sports season, we all need meals that can be cooked quickly. I always choose to put my crumb mixture in a rectangular dish that’s the exact size of the chicken breast. It makes coating the chicken oh-so-easy. 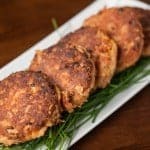 The crumb coating I use when making this easy chicken parmesan is a 2:1 mixture of bread crumbs to parmesan cheese plus some herbs. Dip the meat in egg before coating with the crumbs. If you’re wondering how do you keep chicken parmesan crispy, you must cook the coated breasts in very hot oil in a single layer. This will give them a crispy golden outside and won’t leave them soggy. It won’t qualify as the best chicken parmesan recipe if you don’t have well cooked chicken. 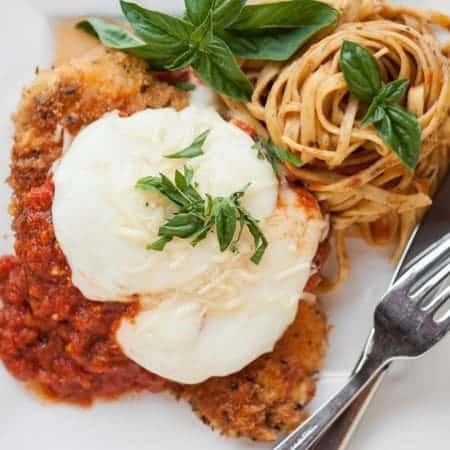 To finish off your chicken parm, all you need to do is top those crispy seasoned chicken breasts with a healthy portion of amazing tomato pasta sauce and then top that with some slices of fresh mozzarella along with some grated parmesan. Finish the whole thing off in the oven to get the cheese all nice and melty. I served my parmesan chicken up with some basil pasta that I tossed in some of the reserved pasta sauce. Meat tenderizer: If you don’t have one of these in your kitchen, you should get one. The rolling pin also works, but I love the weight and the feel of this meat pounder. It creates evenly thick and perfectly tender cuts of meat, and you’ll enjoy using it! Fry pan: I’ve been using Staub cookware for years. It gives your food a great crispy outside and distributes the heat evenly. Baking dish: I’ve been using stoneware for a decade and a half, but I’m ready to invest in pretty baking dishes like this one. To learn how to make my Perfect Chicken Parmesan, watch the video below! 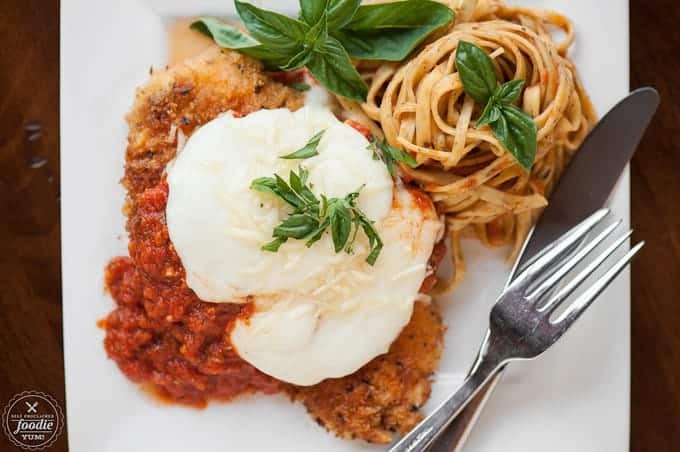 Perfect Chicken Parmesan is the best chicken parmesan recipe you'll find. Full of flavor, takes minutes to cook, and is my favorite chicken dinner recipe! Using a large plastic bag or plastic wrap, cover chicken and flatten to half inch thickness using a meat pounder or a rolling pin. Sprinkle salt and pepper on both sides of chicken. Add flour to bowl. Add beaten egg to another bowl. Combine bread crumbs with 1/2 cup parmesan (reserving the other half for later) along with the basil and oregano in a dish large enough for the chicken breasts. Heat oil in a very large skillet over medium high heat. Dredge chicken in flour, then coat with egg, then cover with bread crumb mixture. Press coating onto chicken to get as much as possible to stick. When the oil is very hot, just below the point where it begins to smoke, add your coated chicken. Continue with the remaining chicken breasts. Cook each breast until golden brown, about 2 minutes on each side. Remove from pan and transfer to baking dish. Cover each breast with Mezzetta Napa Valley Homemade pasta sauce as well as a couple slices of mozzarella and the remaining parmesan cheese. You may reserve some of the sauce to serve with pasta on the side, if desired. Cook in preheated oven until cheese has melted, about 5-10 minutes. It seems a pity to do such a nice job with the chicken and then pour sauce right out of the jar onto the food. Find a nice tomato basil that you like and saute the garlic and onions and it will be infinitely better. Once onions (or anything else) sits in sauce for a few months you lose a lot of the point of using them. You emphasize “quickness”. Baking chicken after frying it dries it out. Just drop the sauce on the chicken, put on your cheese and put a cover on the frying pan. The steam from the sauce will melt the cheese in 15 seconds. The oven is wholly unnecessary. 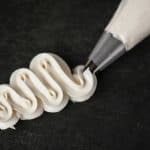 If you didn’t like the recipe, write your own. Sounds yummy too me. Sounds like a wonderful dish. I will definitely try. If you cover the chicken well so that the steam is trapped inside, it doesn’t dry out the chicken. I cooked this for my family tonight. The chicken was tender and juicy. It never dried out. Wonderful flavor!!!! Looks great! Where can I find this jar of sauce please? This is about the same way I make chicken parm, and the Mezzetta sauce is the best of jarred sauces in the market. I use the marinara. Sure, always best to make your own but not always convenient. I pounded my chicken breast and cooked each one 1 minute a side for a total of 2 minutes. They were still not cooked in the oven after 10 minutes. I had to keep mine in the oven longer. Did you use chicken tenders instead or cook them longer on the stove top before placing them in the oven? Sorry to hear that! With meat, cooking times always vary based on the temperature of how your oven cooks, the thickness of the meat, and how cold the chicken was prior to cooking. I hope that it still tasted great even though it took longer to cook! Followed the recipe exactly, even used the same sauce and it came out perfect! The chicken was very moist. By putting it in the oven for only 5 mins isn’t really enough to dry out the chicken. I will definitely make this again. Made this tonight for my family. Everyone loved it!! Very easy to make. The only thing different I did was to do 1/2 cup panko and 1/2 cup Italian bread crumbs. Will definitely be making again soon when my daughter comes home from college!!! Thanks!! This was delicious! I used a hot cast iron skillet to fry it in before putting in oven and it it turned out amazing . Will be pulling this recipe out for future dinner guests….thanks for sharing! I made this last night and it was incredible! My family loved it and said it was restaurant-quality! I will be throwing all my other chicken parm recipes away and will only be using this one. It was simple and very delicious! Hi Krissy, I’m an Italian-American and I want to tell you your recipe for this chicken parmigiana is AMAZING!!! 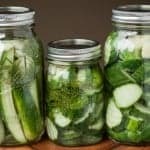 Honestly the best I’ve found as far as online recipes go! Thank you and I just subscribed! Our family absolutely loves this recipe, and the recommended sauce. Do you have any suggestions on temp and cook time from frozen; considering premaking a few. Oh boy. Well, if you make ahead everything would be cooked and just need to be heated through. I probably would not change the temp but would plan on cooking at least an hour. If you try this, will you please come back and let me know what you did and how well it worked so I can incorporate it into the recipe? thanks! Hi krissy! This looks like a wonderful recipe. I️ would like to make this for my boyfriend but we will have to do a couple of things right before so I️ was hoping that I️ could have this prepped pretty well. Would it alter the taste at all if I️ have the chicken all cooked about 2-3 hours ahead of time and all I️ would have to do right before would be to assemble and bake in the oven? Hi Kelsey, You absolutely can make the whole recipe up to the part where you stick it in the oven to melt the cheese. Just be sure to take it out of the refrigerator and let it come to room temperature before you stick it in the oven. It will take longer to heat through, but should work fine! Love this recipe. I thought it was time to leave a comment because I’ve cooked it about a dozen times and each time never disappoints. Thank you! Followed the recipe, used classico four cheese bottled sauce added in some garlic, and it came out AWESOME!! my boyfriend usually does all the cooking and when he had this nice juicy chicken Parm, he was SHOCKED! I am super proud of myself but so thankful I followed your recipe thankyou so much again!!!! Excellent recipe! I’ve made this over 12 times and it never disappoints. I also use a panco/Italian bread crumb mix and also add some peccarino Romano to the parm. cheese. I then put the coated breasts in the fridge for and hour or so then pull them out to rest at room temperature before frying in peanut oil. I finished the browned and topped chicken under a broiler set on medium. This gives a lightly carmalized melted cheese which only adds to the depth of flavor from top to bottom. 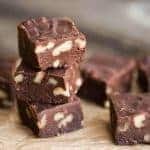 Best recipe I’ve found yet. Thank you for sharing! I haven’t made chicken Parmesan for my husband in a long time. I will add chicken Parm to my list for next week. Love Chicken Parmesan!! This recipe looks perfect and love the fresh mozzarella!!! Whoah this does look PERFECT! Chicken Parm is a favorite in our house! 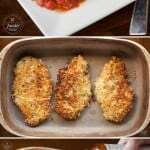 I always crave chicken parm and cannot wait to try this recipe! Looks so good! PERFECT for a quick and easy meal! I love quick delicious recipes and this one certainly fits the bill! SO MUCH YUM! You’re right, this was SO perfect! I need to put this on the menu this week! Looks sooo good!! Can’t wait to make! This is always a family favorite! Such a easy way to get a delicious meal on the table on a busy weeknight! This is one of my favorite weeknight meals! Yum!